Classic Film and TV Café: Get Ready for Halloween with "House of Dark Shadows"
Get Ready for Halloween with "House of Dark Shadows"
The intended audience for House of Dark Shadows was undoubtedly fans of the popular 1966-71 ABC gothic daytime drama. If you watched the TV series dutifully (like me), you will enjoy this faithful big screen adaptation. For other viewers, though, House of Dark Shadows is a respectable 1970s vampire film with modest production values and a low-wattage, though quite capable, cast. The film opens with unemployed handyman Willie Loomis, a modern-day Renfield, inadvertently unleashing vampire Barnabas Collins (Jonathan Frid). Freed from decades of captivity in his coffin, Barnabas makes a house call on the wealthy Collins family, introducing himself as a cousin from England. 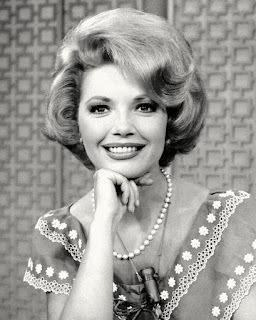 The family welcomes the charming Barnabas, who presents matriarch Elizabeth (Joan Bennett) with a thought-to-be-lost, emerald-encrusted heirloom. Yet, while everyone else is enamored with the newly-discovered, gift-giving cousin, Professor Eliot Stokes (Thayer David) becomes immediately suspicious when the vampire avoids some pointed questions. 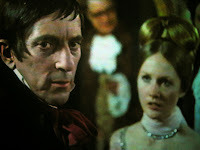 At a costume party, Barnabas meets Maggie Evans (Kathryn Leigh Scott), the apparent reincarnation of his lover Josette. While he woos Maggie, he has to deal with two jealous rivals for his affection: Carolyn Collins--who has become a vampire courtesy of a casual Barnabas biting--and Dr. Julia Hoffman (Grayson Hall), who has fallen in love with the vampire while developing a cure for his affliction. Not unexpectedly, things go badly for Barnabas, especially when Julia substitutes the anti-vampire serum with a drug with some unpleasant side effects. Fans of the TV series will quickly recognize that the first 75 minutes of House of Dark Shadows condenses the TV show's familiar plot. However, to create an acceptable climax (and perhaps reward fans with some new material), producer-director Dan Curtis opts for a dramatic--and surprisingly bloody--ending. The truncated storyline also means that several popular characters only get a few minutes of screen time. Still, the focus on Barnabas works to the film's advantage, since Frid's nuanced performance is what made the show a hit in the first place. for Night of the Iguana. House of Dark Shadows also rewards fans by incorporating many of the TV series' familiar elements, from Robert Cobert's haunting music to the shadowy photography and atmospheric settings. Personally, I wish the film had been shot in black-and-white like the first year of the TV series (which looks much better than the later color years). However, mainstream black-and-white films were no longer in vogue by 1970, so that wasn't a realistic option. For non-fans, House of Dark Shadows is a straightforward horror film released in the same year as another contemporary vampire outing, Count Yorga, Vampire. The Dark Shadows script has some bite (sorry! 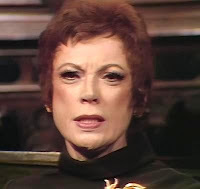 ), such as when Carolyn (soon to be a vampire) tells Barnabas: "There's so much about you that I'm dying to know." One must also admire how the film avoids the whole "there are no such thing as vampires" discussion. Once Professor Stokes proclaims a vampire is to blame, everyone seems to accept that theory. (Of course, the townsfolk--except for Stokes--are slow to connect Barnabas's arrival with the sudden appearance of the bloodsucker). After House of Dark Shadows turned into a solid box office hit, Curtis set out to make a sequel. However, the TV series had ended by then and Jonathan Frid had moved on to other roles. Therefore, Night of Dark Shadows focused on other characters played by David Selby, Kate Jackson, and Lara Parker. It was a modest hit, but no further sequels appeared. 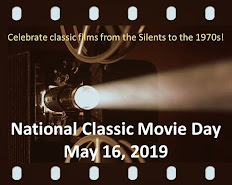 That was not the end of Dark Shadows, of course, which has been released on video, revived multiple times for television, and recently turned into a campy motion picture by Tim Burton. The simple fact is that you can't keep a great vampire like Barnabas Collins down for long. I saw this when it first came out, and would really love to see it again. I was such a huge fan of the original series, my own every-day after-school special! Of course I loved Jonathon Frid, and I've always found Thayer David to be an asset to movies he is in. Wish someone would show it this month. Nice piece, Rick! Rick, like you I was an ardent fan of "Dark Shadows" and we would turn it on after returning home from school. I haven't seen this film in a while and didn't have an interest in seeing Burton's work, based on the previews. But is is awfully fun to reminisce about a favorite viewing habit of a young girl. Great post for October! Every time I hear about this movie I feel an obligation/compulsion to pass along this anecdote about when I first saw it. House Of Dark Shadows opened in Chicago the first week in November of 1970, just before the midterm elections. There was a hotly contested local race for the presidency of he Cook County Board of Commissioners, between Democrat George Dunne (the incumbent, and the father of auxiliary Blues Brother Murphy Dunne) and Republican Joe Woods (the Cook County Sheriff, and brother of Pres. Nixon's secretary Rosemary Woods). Woods was running a series of ads on TV (filmed in Hollywood - I recognized some of the actors) in which "citizens" complained that the County Board wasn't doing enough about this, that, and the other. Then Joe Woods would stride out like John Wayne and announce (in a honking basso drawl) that if elected, he would do this, that, or the other. So it's a few days before the election, and I'm in the Roosevelt Theatre in downtown Chicago on opening day, watching House Of Dark Shadows with a pretty good-sized crowd for a Friday afternoon. Mid-movie comes the standard group scene in the mansion, and somebody says something like "Someone should do something to stop these attacks!" "Ah'm Joe Woods! 'Lect me President of the Cook County Board an' Ah'll do somethin' about vampahrs!" Ha! I googled "I'm Joe Woods, elect me...and I'll do something about..." and this popped up. I remember him from about 1965 and even then he seemed dumb as a doornail. I enjoyed this movie as well, seeing it for the first time just a couple of years ago, but Barnabas always irked me in that, despite wanting so desperately to be a normal human again, he still took full advantage of his powers to get everything else he wanted. I think the old cad was a bit hypocritical in that regard. If you have Comcast digital cable, you can see this movie free on demand for a limited time. We're watching this one this year as part of our Halloween movie night. I haven't seen it in years adn looking forward to re-visiting. We're also watching "Island of Lost Souls" with Charles Laughton. We haven't picked the third movie yet. That was in the hands of my friend's 22-year-old son, so I suspect it will be something contemporary. David was limited in acting ability. KLS DS are full of sloppy mistakes. Nancy Barrett is the sexiest woman ever. Those DS books have way too many mistakes.But Nancy Barrett is a God-send to any show. TCM showed "House of Dark Shadows" yesterday. Incidently , Maggie Evans couldn't be the reincarnation of Josette since , in the TV series, Josette's ghost haunted Collinwood. She can't be a ghost & a reincarnation at the same time. Maggie just had the misfortune of resembling Josette. Someone once pointed out to me that "House of Dark Shadows" was basically "Vertigo" with vampires ! Watch the 2 films & notice the similarities. The VERTIGO similarity is an interesting way to think of HOUSE OF DARK SHADOWS! Saw this on a double with "Night of the Living Dead", was far more impressed with "House" which had some real thrills 'n' chills--the pursuit and staking of Caroline and the wonderfully loud and gory ending. 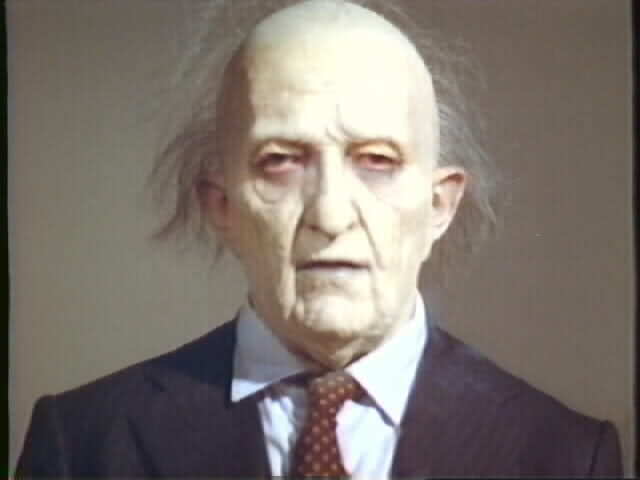 Frid was a great vamp, light years ahead of Depp in the wretched movie (he looked like a penguin). And everyone (almost) gets vamped! Joan Bennett disappears toward the end, I wonder if she just refused the teeth. One of the first TV series to get movie-ized--the only one I can think of before is the original "Dragnet" in the mid-50's. For authentically reincarnated lovers, check out the Karloff "Mummy." Of course Maggie could be Josette returned, there were no ghosts in the movie, it was totally separate from the TV series. They brought the ghosts in for "Night." Piper Laurie Elevates "Smoke Signal"
See What Bogart Sees in "Dark Passage"